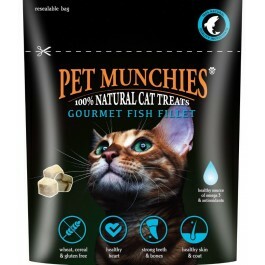 Pet Munchies Gourmet Fish Fillet are premium natural gourmet tasty freeze dried cat treats made with quality, human grade real fish. Delicious, Nutritious and Wholesome… all made with 100% Natural, human grade fish, just like nature made them, with natural textures, flavours and exceptional palatability cats love. Made from 100% Natural Quality Fish Fillet. Fish is a rich source of vitamins and minerals including Omega 3 and antioxidants, which help maintain a healthy a heart and promote healthy skin and coat. The high levels of calcium and selenium found in these treats is great for teeth and support joint mobility. Naturally Low in fat and calories and easily digestible. Wheat, Gluten and Cereal Free. Pet Munchies products are naturally low in fat & carbohydrates, and are low in salt. They are delicately roasted to perfection to ensure quality and flavour. No artificial colours or flavours are in these products. Ingredients: Pollock 94.34%, Vegetable protein. Typical Analysis:Crude Protein 85.00%, Crude Oils and Fats 2.00%, Crude Fibre 1.00%, Crude Ash 6.00%, Moisture 8.00%.